Hello, all! Hope you’re well! Guys, I’m super excited about this dress! 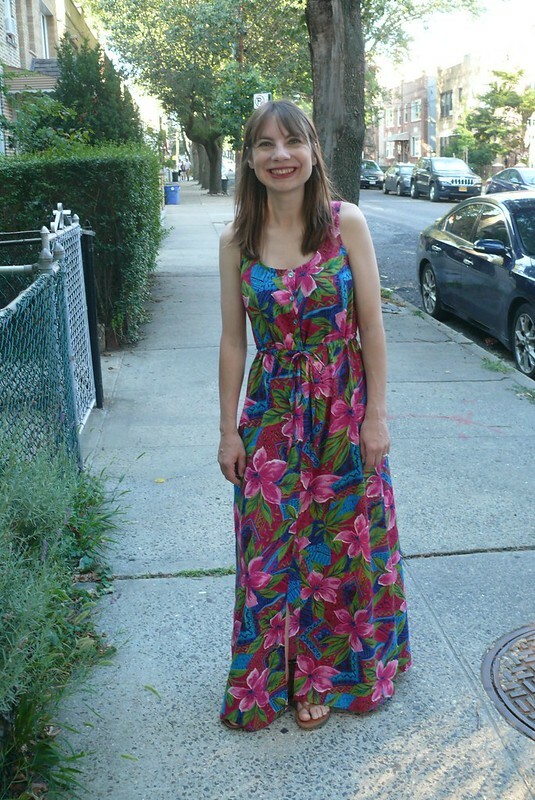 It’s the True Bias Southport Dress, aka, the perfect summer dress! Kelli sent me a copy of the pattern to try- thank you, lady! I can’t say I’m an unbiased (is this a pun? I hope not!) reviewer, though, as I have a total crush on Kelli’s style and seriously love every. single. thing. she makes and designs. Fun fact: the clothes Kelli makes for her daughter basically make up my ideal wardrobe. Plus her daughter’s like 5 years old, but she’s got a better closet and much better hair than me. Seriously, if there’s a better-dressed kid out there, I don’t wanna know about them… I can’t handle that kind of competition! Ooh, that reminds me! There’s a mini Southport dress pattern for kids sizes 4T-10! Check it out! OK, so, I love this dress. It’s one of those magical patterns that pop up from time to time in the sewing blogosphere that just looks great on everyone who makes it. Don’t believe me? Check out: Meg, Heather, Katie, Jenny, Coco, Lorene, Amanda, and Andrea. How awesome do all these ladies look?! The dress is sleeveless, with a button placket (but if you checked out the links above, you can see that some people chose to make a non-functional placket, and others to omit the placket altogether and just cut out the bodice on the fold). There’s a knee-length skirt, or a maxi variation with a front slit. 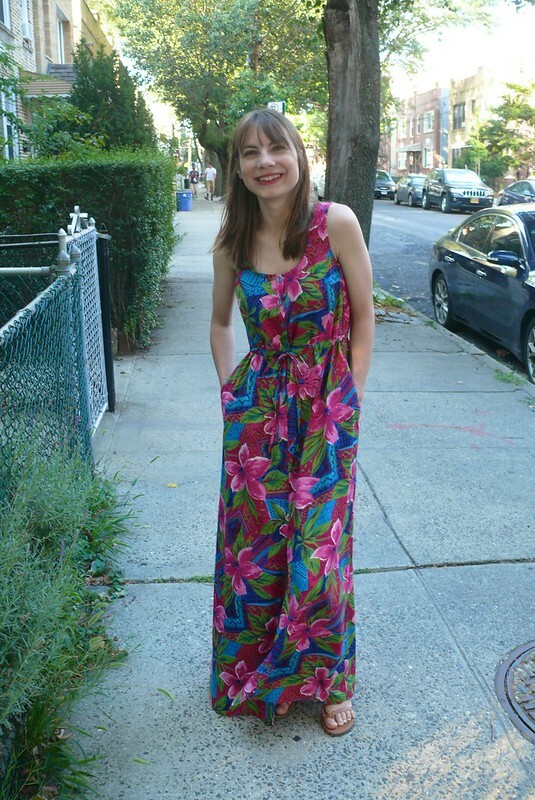 I decided to do a maxi this time… go big or go home, right? The dress was easy to sew, and the instructions are clear. I really like the way that the drawstring casing is formed- it’s very tidy and looks really professional. My only regret is that I used packaged bias tape instead of making my own. I had some in my stash that was the perfect color, so I was excited to use it, but it’s much stiffer than this rayon challis. Whoops! 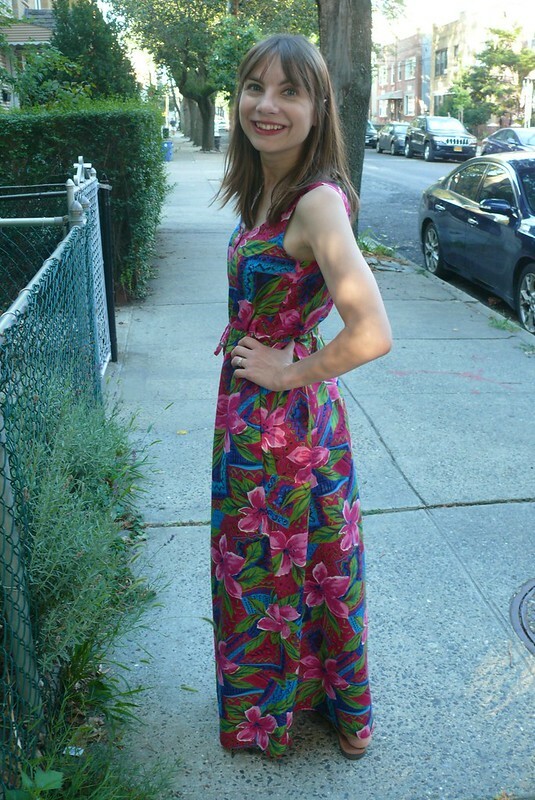 Speaking of rayon challis, this ridiculous Hawaiian print came from Fabrics for Less on 39th Street. My buddy Sam gave me a “special deal” on the fabric- the price marked on the sign, ha! It’s a pretty stupid print, but I love it! Whatever, Man Friend, I love it! Ginger Made: Undercover Hood + Hudson Pants! Hi, friends! Hope everyone’s had a wonderful weekend! Question for you: those of you who blog, do you find it hard to blog basics? I often find that I start wearing them right away, and once I’ve worn something a few times it feels kind of silly to blog about it! I’m also not sure if people are interested in reading about basics- too boring, maybe? But I decided to finally share these garments as I wear them ALL the time and it just doesn’t seem polite to ignore them. Let’s start with the pants! These are the True Bias Hudson Pants. 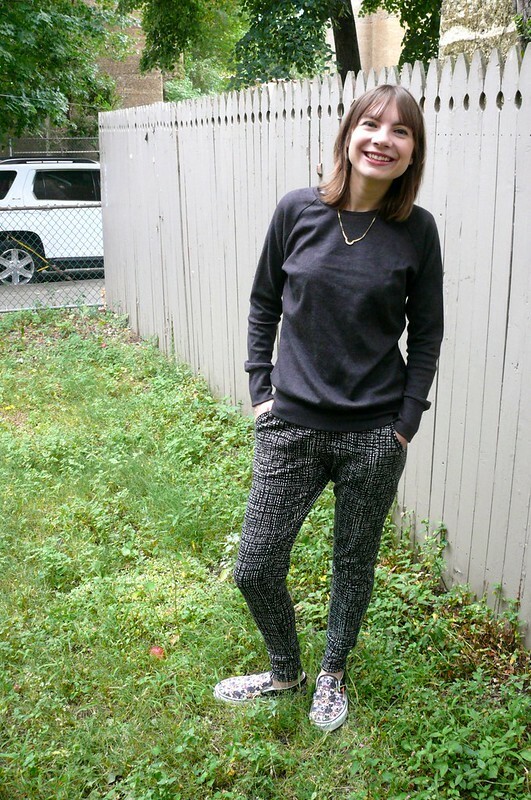 Kelli is a blogger I’ve admired for a long time- her style is just so cool. I kinda want to break into her house and steal everything out of her closet (and her daughter’s… Kelli’s made her some awesome clothes!!!). 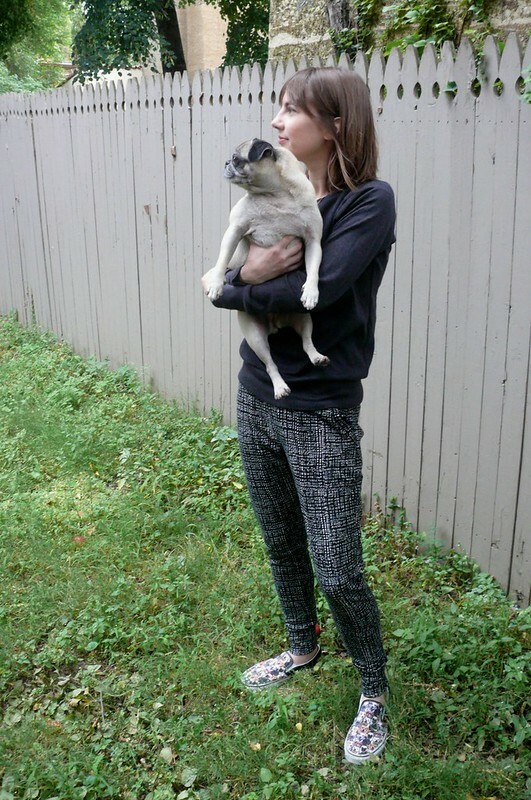 I tested this pattern when Kelli was developing it, but these pants were made with the final pattern (I made two pairs during the testing process, but the fabric I had in my stash was earmarked for my sister, so I sent them to her. Then I somehow lost or threw away the test pattern, so I printed out the new one when I made these up). I am one size smaller in the waist than in the hip for this pattern, so I went with the larger size since it’s fitted through the hips and the waist is elasticized. There’s not much to say about constructing these puppies! They’re very straightforward and quick to sew, and the end result is really cute. 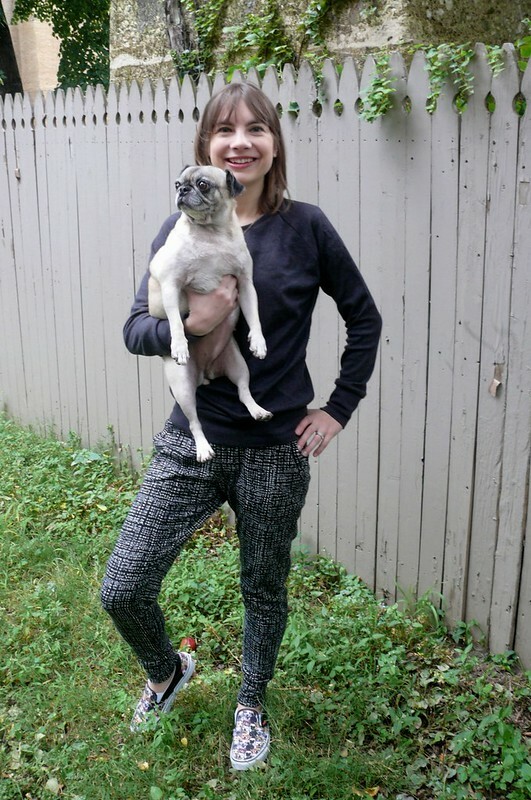 I’ve also made the Papercut Patterns Anima pants (Kelli and Katie developed their patterns independently at right about the same time, coincidentally… great minds think alike! ), and compared to those, the Hudsons are a much slimmer fit (here are my Animas for comparison). I used a thick, strange knit from Mood. It’s definitely something synthetic as it feels almost… squeaky?… against my skin, but the print is so cool that I couldn’t resist it! I really like how they look in this print! 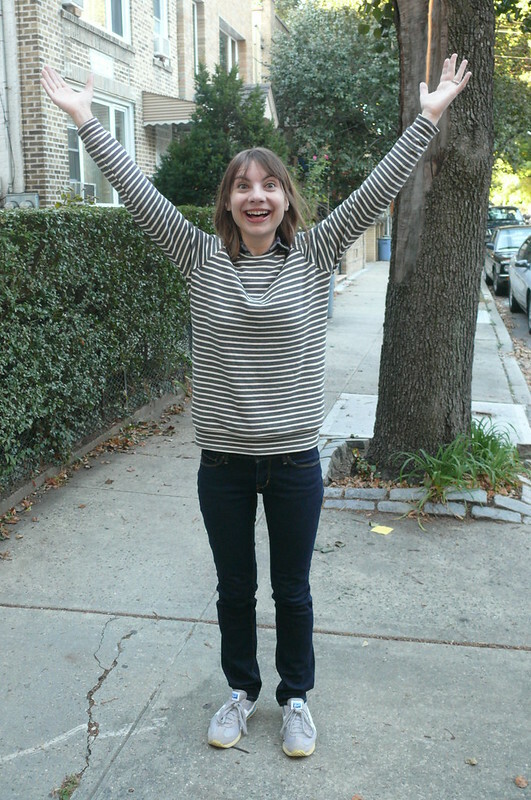 Here’s where fabric is funny: the striped fabric is stretchier than the wool, so the sweatshirt felt way bigger. Strange, right? 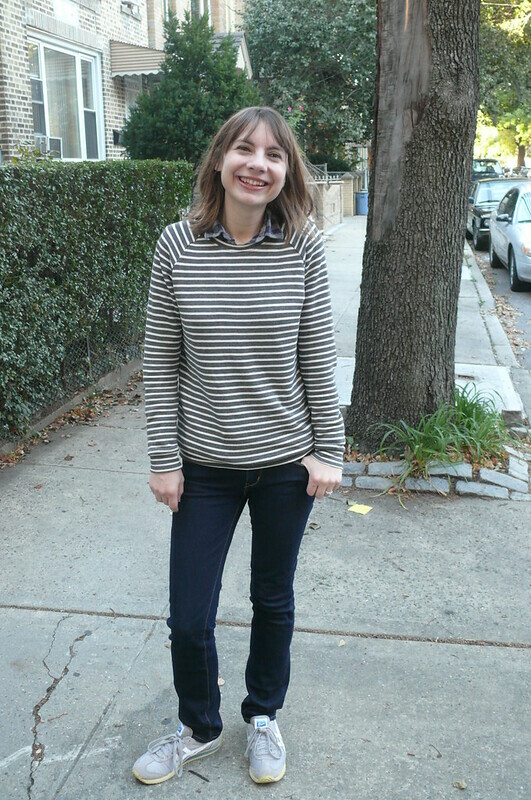 After sewing it up, I took off the cuffs and hem band, shortened them by 2″ and 1″ respectively, and it looked much better. It was just a bit too slouchy before! Sidenote: is there a way to perfectly match stripes on a raglan sleeve? I just. couldn’t. do. it. Ugh! Hopefully it’s not too noticeable. 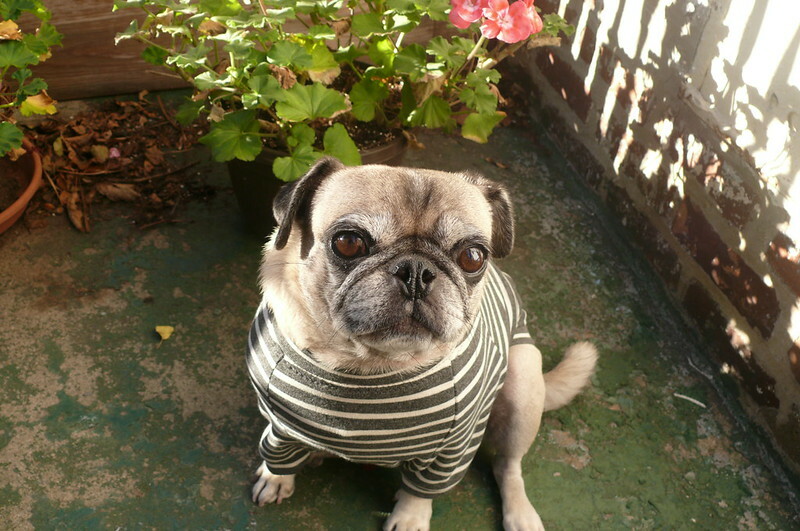 Now, this fabric is a really nice weight, and I didn’t want the little bit I had leftover to wither away in my stash, so I did what I had to do: I sewed a pug sweater. Somebody isn’t happy about his new sweater. Pretty sure I’ve now officially entered Crazy Dog Lady status. I didn’t want to fuss around with drafting a pattern, so I downloaded one from Milla Milla, a Japanese company that offers PDF dog sewing patterns. It’s Very Purple Person‘s fault! She made matching shirts for her son and her dog that turned out really cute, so I downloaded the same pattern. 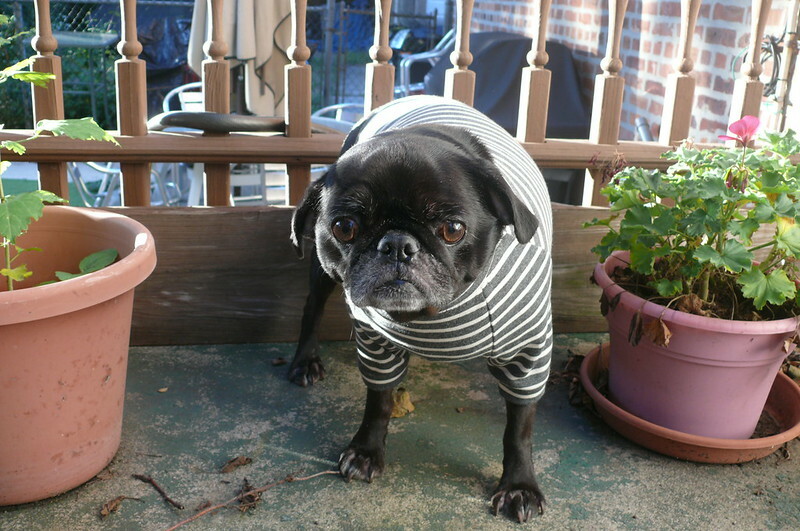 Pugs don’t fit well into regular ready-made dog clothing because their proportions are different. Hear me out! They have thick barrel chests and basically need dog FBAs (OK OK OK I know I’m crazy!)! But this pattern was drafted specifically for French bulldogs and since they’re also squat, chesty dogs, I thought it would be perfect! This is the Hoodie & Sweatshirt pattern, and it was surprisingly complicated! Once I watched the video showing how to sew it up, it was a breeze, but I couldn’t for the life of me figure out how the pattern pieces went together before watching it. Fellow pug owners, if you’re looking for the right size, just select “FB” from the drop-down menu. There’s also a version drafted specifically for dachshunds… it even comes in two sizes! So Anne, Juli… you’re covered! Now let’s play a little game of “Who Wore It Better?”! Feel free to cast your vote! I have no idea how to wrap this post up so I’m just going to stop talking. What’s on your sewing table? 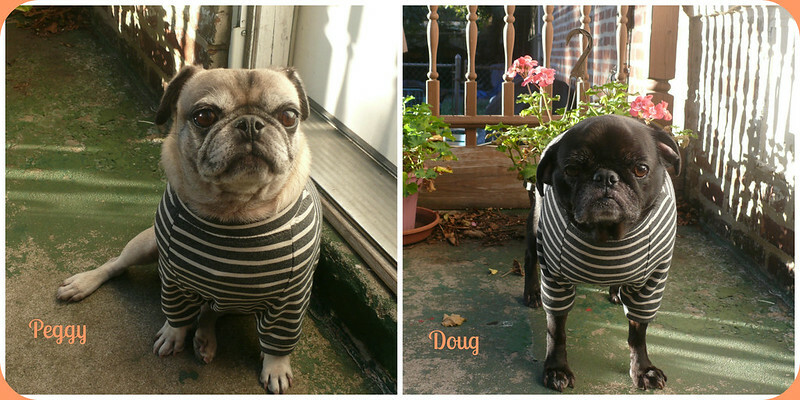 Have you ever sewed for your dog or cat? Be honest!! !